As the dishwasher market continues to evolve, brands continually develop new technologies in order to bring quality and new features to their users. So how do you choose the best dishwashers from over 20 brands and hundreds of unique models? We've done the legwork and created this guide to highlight the best dishwashers of 2019. Whirlpool is often considered the king of quality budget dishwashers, and their WDT730PAHZ is popular for a reason. It offers many great features with a price tag that dips below $500 during seasonal promotions. Cleaning and drying performance receive some of the highest marks among consumers. Meanwhile, Whirlpool can reduce their price with design features including a cheaper plastic tub and a 51 dB noise level that’s not ultra-quiet but acceptable for most home uses. Meanwhile, you’ll enjoy 5 wash cycles and 5 options to cover every type of soiling, plus sensor wash and 1-hour wash features to help you get exactly the wash type you need no matter the application. You’ll also find a height-adjustable upper rack for increased flexibility and a combined dry system that uses both a heating element and a fan for enhanced drying. The hidden controls of the dishwasher give it a sleek, expensive look, and Whirlpool consistently rates highly for great reliability and low maintenance costs. Spare parts and service are generally very easy to locate. Check out our blog post about Whirlpool Dishwashers for more in-depth analysis. Very quiet at 44 dB, 5 wash cycles, full Stainless Steel interior - Bosch is famous for its high-quality dishwashers, with a proud lineage of producing one of the quietest dishwashers on the market. Their 300 line is incredibly popular, filled with great features and an attractively affordable price tag. The SHEM63W55N is one of the best options available. Features include a stainless-steel tub for effective drying and better soundproofing, plus a higher durability rating. Meanwhile, the 44dB noise level won’t disturb you at all while the 5 wash cycles and 4 options are powerful enough for all types of soiling. The Auto Wash option is sure to be a favorite, offering a soil sensor and Speed60 One-Hour wash cycle to give you exactly the level of cleaning you need in a shorter period. The 3rd rack gives you lots of flexibility in loading and space allocation, and you’ll also find a RackMatic feature that allows you to adjust the heights of all three racks. This is an unprecedented level of flexibility in a mid-range dishwasher, making this product from Bosch a must-have in the under-$750 range. Once we reach the $1,000 range, we begin to see Bosch’s famous pocket handle design. It’s a beautiful design visually, but beauty isn’t all that’s changed. At this price range, the SHP865WD5N gives you astounding features and some of the best reliability around. From the stainless-steel tub to the 44dB impossibly quiet noise level, this dishwasher is made to be easy on the eyes and the ears. Meanwhile, excellent features like EasyGlide racks and FlexSpace tines mean that you can truly customize this machine to make it your own. Three racks give you plenty of space, while the Extra Dry option offers condensation drying that’s boosted to maximum capability. When it comes to washing power, five wash cycles and unique options give you lots of flexibility. You’ll also find the same Sensor Wash and Speed60 cycles in the sub-$750 model, plus the famous pocket handle that will look absolutely stunning in your kitchen. Please check out our blog post about Bosch Dishwashers for further information. Bosch's 800 line is their most famous line, and it's no surprise. The 800 line has the great Bosch features with elegant design, and SHPM98W75N deserves every penny of $1119, which you can find with seasonal promotions. This series boasts the sleek pocket handle design and modern touch control panel, adding a streamlined aesthetic to your kitchen. The stainless steel tub offers more durability and easy clean-up than models with plastic tubs. The 39 dB noise level benefit is one of the best in the market. In fact, very few can beat noise levels with 38 dB. Homes where the kitchen blends with the main living space would benefit from a dishwasher this quiet. Another key feature of this unit is the V shaped MyWay and 3rd Rack. That 3rd rack offers loading flexibility, and the V shape allows loading bigger loads to middle part while giving you a place for taller products in the side of middle part. In addition to the 6 wash cycles and 6 options that offer versatility for different dishwashing needs, the Sensor Wash + Speed60 is a one hour wash cycle that can sense and determine which cycle is needed. This feature is ideal for families on-the-go who need quick cycles to fit their needs. That’s right; it’s Miele. That’s because when it comes to the dishwasher market, Miele is consistently defining and redefining perfection. They produce every piece of their dishwashers and promise a 20-year life—the highest anywhere on the market. So, without further ado, meet the Miele G662SCUCLST from the EcoFlex Crystal series. It boasts the best drying ability on the market, plus a whole lot more. The first thing you’ll notice about this Miele beauty is all of that gorgeous, smooth and silky stainless steel. It’s everywhere—from the delightful exterior to the sturdy interior tub. While the noise level of 45 dB isn’t best in its class, it’s still impressively quiet and more than enough for the average home. When you wash your dishes with a Miele, you can expect to get spotless results thanks to its superior water softener technology which helps eliminate calcium deposits (i.e. no water marks). Miele uses expensive professional-commercial-grade pumps to guarantee excellent results, every cycle. You can trust the G662SCUCLST even with your expensive china and fine wine glasses. So how about that best-in-the-world drying performance? It comes courtesy of a true condensation drying system that results in perfect drying, every time. You’ll also benefit from features like SensorDry, AutoOpen door system, plus a quick wash and auto wash option for flexible and convenient cycles. You’ll also find a 3D+ cutlery tray system that makes your dishwasher interior fully flexible and customizable for your dishes and needs. And with an integrated water softener, Miele ensures that your dishes are protected for the long-term. For more info about Miele Dishwashers, check out our in-depth buying guide. Like any product, there are certain factors everyone should consider when buying a dishwasher. You guessed it. A dishwasher must wash effectively, and it has to give you back your dishes dry and ready to be put away. A fancy dishwasher with all the latest tech innovations doesn’t mean much if it doesn’t keep your dishes clean. When it comes to washing, it’s vital to have enough wash cycles and options to cover all kinds of soiling types and levels. A quick wash cycle is an excellent advantage, particularly since most energy-efficient cycles these days can last as long as two hours. Sensor Wash is also a major plus, giving you the option to automatically adjust wash duration based on soil levels and the number of dishes. You’ll also want to select a dishwasher with quality nozzles and spray arrangements to ensure quality care. Meanwhile, drying effectiveness is just as vital. There are two main drying techniques. The first uses a heating element to heat up and evaporate moisture on the dishes. The second, and most effective, is condensation drying. This method cools down stainless steel walls surrounding the dishes to pull moisture away and onto the walls. Other helpful drying features include auto-opening doors at the end of cycles and integrated fans that help reduce moisture after cycles. As we mentioned above, modern era dishwashers have longer wash cycles. This is mainly because Energy Star system standards require fewer amounts of water and energy usage. For all these extra washing hours, nobody wants to listen to a noisy sound next to them during dinner. Consequently, the noise level is a vitally important consideration for your comfort. Today, noise levels of dishwashers range between 38 dB to slightly above 60 dB. Keep in mind, anything below 50 dB is good and below 45 dB is super. By the way, dB is shorthand for decibels—a unit of measurement that applies to sound level. As an example, a whisper is around 30 dB, a library is 40 dB, light traffic is 50 db, and a regular conversation tops out at about 60 dB. For more information, check out our Dishwasher Quietness Article. First and foremost, the interior design of the dishwasher and its flexibility are vitally important. Features like 3rd racks make washing easier, more convenient, and more effective. Third racks create more options for your thin dishes and valuable silverware, and may producers use movable tines and height adjustments in the lower racks as well. Foldable tines, adjustable height racks with smooth movement, and well-placed silverware jets are all useful features that make your life easier when washing. Don’t forget; a stainless-steel tub is a much better choice with longer life and better soundproofing. Finally, you want to have a beautiful machine on the outside, too. Manufacturers are now producing a wide range of visual designs and finishes, from stainless steel and black stainless steel to fingerprint-resistant designs and everything in-between. Even the best-looking, most powerful dishwasher doesn’t mean much if it’s going to break down months after arriving in your home — reliability matters. It’s particularly important to consider that not all brands have a flawless track record—even from model to model. Some of the most dependable brands include Miele, Bosch, and Whirlpool. You can almost always count on them to provide a product that will last in your kitchen. Check out our comprehensive Dishwasher Buying Guide that pinpoints everything you should know before you buy. A dishwasher is a personal appliance, and you’ll want to make a pick that suits your unique needs. 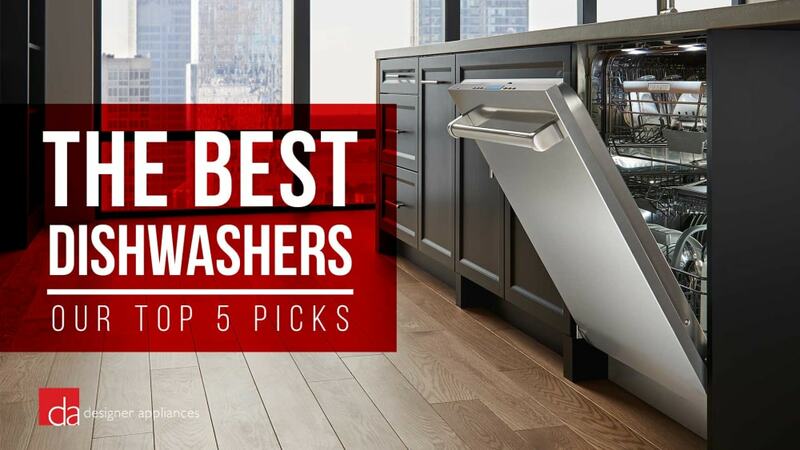 In this top 5 dishwashers list, we strived to feature both quality and modern design that will appeal to a broad set of tastes. If you need help choosing the best dishwasher for your family's needs, be sure to reach out to our sales team. If you're in the NJ area, we invite you to visit one of our appliance stores.